An Atlanta man moves from homelessness to hope. This was not the same old, same old graduation ceremony. Forget about the men marching down front in cap and gown to the tune of Pomp and Circumstance. Many of these men had been ransomed from alcohol and set free from drug addictions. And as many of these homeless men stepped up and received their graduation certificates, it was the first time they had ever completed anything. The graduation recognized they had successfully completed Stepping Up®, the 10-lesson series for men created by FamilyLife®, Cru’s ministry to families. The DVD series and resources challenge men to “A Call to Courageous Manhood”—to be all that God has designed them to be. 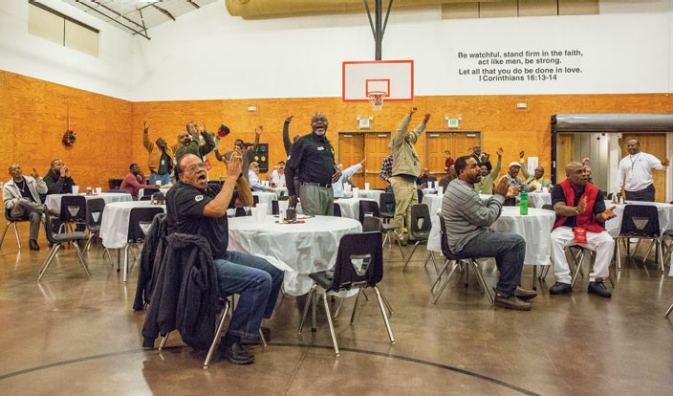 As each man’s name was announced, the men erupted with clapping and cheering that echoed throughout the Community Hall room at The Potter’s House, a rural facility of Atlanta Mission in Jefferson, Georgia. Calvin is one of the graduates, and one of 647 people whom Atlanta Mission helped last year and who are no longer homeless. But Calvin wasn’t at the graduation—shortly after the program began, Calvin was already asleep. He goes to bed at 7 p.m. so he can get up just after midnight to pray, read the Bible and worship before clocking in to work at 6 a.m. The following morning, Calvin climbs the concrete steps to where he now works at Atlanta Mission. The building spans a city block in the heart of Atlanta, across from Pemberton Place—home to the Center for Civil and Human Rights, the World of Coca-Cola and the Georgia Aquarium. It’s a lofty goal, but Calvin believes it’s possible. In metro Atlanta, more than 10,000 people are homeless each night. But not all of them are homeless because of drug addictions. According to HomeAid Atlanta, “The three most commonly cited causes of homelessness for persons in families were lack of affordable housing, poverty and unemployment.” Calvin helps Atlanta Mission serve between 800 and 1,000 people on a daily basis—including men, women and children in their five facilities. Yet he would never have learned about Stepping Up if it wasn’t for Jim. Jim is now president and CEO of Atlanta Mission, and when he first started in 2008, he wondered how to create organizational change in what they were doing. “I think God has a bigger plan than [the homeless men] coming in and leaving everyday,” he says. In 2014, Jim learned how FamilyLife’s Stepping Up men’s DVD series was transforming men’s lives in prisons, so he decided to go through it with his staff and the 130 homeless men at the mission. He also understood the vision for reaching the men at other missions. He spent his own money to buy 60 copies of the DVD series and distributed them across the U.S. The second time Atlanta Mission went through Stepping Up, another 118 men received graduation certificates. The FamilyLife resource uses the acronym “STEP” to lay out four broad courses of action for men to take. They are challenged to be Standing firm, Taking initiative, Engaging with wisdom and grace, and Planning ahead and providing. But there are lots of parts to the spiritual formation process at the mission, not just Stepping Up. For much of Calvin’s life, he didn’t step up. Hope was not part of his vocabulary. Five years ago, Calvin came to Atlanta Mission drug addicted. He lived on the streets for 30 years. As a homeless person, he slept in abandoned houses and stayed under bridges. He found his meals in garbage cans. For him and others like him who have wrestled with drug and alcohol addictions, the first step toward transformation starts with a willingness to change. Once Calvin was thinking about leaving the program, but he ran into his counselor, Jesse. “How are you doing?” Jesse asked. “Fine,” Calvin responded, but Jesse could tell he wasn’t doing fine. He counseled Calvin, prayed for him and anointed him with oil. The caring community helped Calvin to finish the program. He can now offer hope to other guests at the mission. One afternoon during the intake process (as guests are registered to stay the night), Calvin greets a roomful of men in the ground-level cafeteria. “How you all doing?” he asks, his voice echoing off the concrete floor. He speaks their language. He has experienced the life-transforming power of God in his life. Some of the men knew what Calvin was like five years ago and how he has changed. Back then, he wanted to die. He was without hope. He believed he would never be free from crack cocaine. For Calvin, it took five years from the time he came to the mission to find a home. From his experience, he is telling others how God restored His life. His new residence is about a block from the now-vacant house he used to live in. “It’s amazing what God will and can do with a man who will get out of the way,” he says. But he believes God told him, Your life that you’ve given up on, it has substance. I have value for you. I didn’t create you for that stuff. Calvin had to kneel down in order to step up.